WikiFont is no longer officially supported. Please refer to the OOUI icons instead. For users still in need of a WikiFont, there is a repo by @prtksxna providing generated fonts. The WikiFont font is created from SVG icon files related to the ones above. View a PNG generated from the current font. Use colors only if it helps user understand a workflow. Red, orange, and yellow are to warn user of a destructive action depending on severity (high to low respectively). Make sure icons are pixel-perfect so they retain their meaning and look sharp in all sizes. An icon should fully express its intended meaning without any text companion. In selective cases when a message or a word is used with icon(s), icon(s) should always appear at the beginning of according to reading direction. Our users are very diverse. Making sure concepts are not offensive and remain localizable are equally important. Icons based on a specific region may not have the same meaning for the rest of the world. For example, an envelope is more practical than a traditional American mailbox. Avoid concepts such as gestures, animals, religion, humor, ethnicity, and gender. Designers should also be aware of icons that convey directionality. Concepts such as “forward” and “backward” are associated differently to “right” and “left” depending on the writing direction of our language. For an English speaker, a “next” button can use an arrow pointing to the right as an icon. Conversely, a Hebrew speaker would expect the arrow to point to the left in order to convey the same meaning. Symmetric icons are always safest. However, should you come up with a more effective solution to convey an idea or a message that is not symmetric, provide two versions to support both directions. When creating new icons, reuse and recompose from existing iconography as much as possible as they have established a meaning with our users. For example, this is an edit icon. To symbolize a disabled edit action due to varying reasons, compose the meaning from the existing edit icon. To symbolize that an edit has been reverted, repeat the same with existing edit icon. 1a. When a user clicks on this icon, he or she will start the process of adding a citation to the article content. This will be used on the Visual Editor toolbar. 3a. Perhaps I missed it; the Compact personal bar has a user icon, but I don't see it example above. 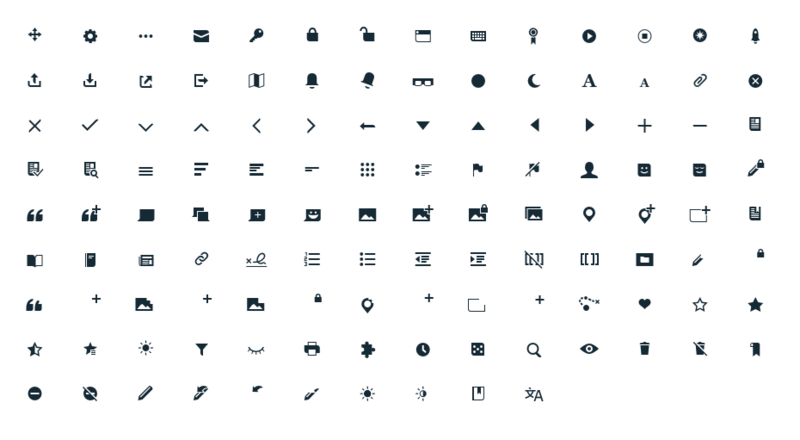 OOjs UI provides these icons in its MediaWiki theme (Gerrit change 188289). Many icons have a "flipped" versions for RTL (right-to-left) languages, and many have colored variants to indicate intention (progressive/constructive/destructive). The RTL versions display automatically depending on the wiki's or user's language. You get the colored versions when you specify certain flags. The Wikifont built out of these icons is at https://github.com/munmay/WikiFont, currently a "Wiki-Glyphs" subset of eventual planned set. See it in the at http://munmay.github.io (soon); view HTML of demo page. Flow is using a local copy of the font for all its icons. Mobile app is using a second font for additional icons, Extension:MobileFrontend and Media Viewer plan to use it. The CSS to use it is at https://github.com/munmay/WikiFont/blob/master/wikiglyphs.css. This includes workaround CSS for IE6 and 7 only. The title attribute on the surrounding tag is a situation-specific tooltip for accessibility. aria-hidden="true" ensures screen readers and other assistive technologies do not "read out" the icon glyph. If you place the span inside Agora classes (such as mw-ui-button mw-ui-constructive class, it will darken and lighten according to the hover/click/disable state along with the other text in the "button". There will be a flash of missing content as the font loads. The glyphs are in a special Unicode range so the browser won't show anything, then when the font is loaded, the icon will appear. In a text browser the CSS rule probably won't do anything. You can compose icons by stacking glyphs, which allows each one to be different colors. This page was last edited on 13 February 2019, at 18:26.